Have you ever tasted the mouth-watering goodness of smoked brisket at a BBQ Shaq or a friend’s house and imagined yourself preparing the same? Although smoking your own meat is considered by many to be a fine art, it certainly isn’t rocket science. Even a newcomer should be able to make a respectable smoked chicken or some ribs the first time around, provided they read up on how to use a charcoal smoker properly. 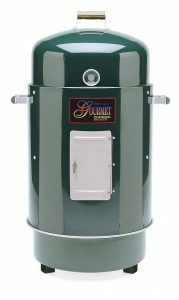 There are tons of different smokers available and sure, the set-and-forget philosophy you get with electric or propane models has its advantages. 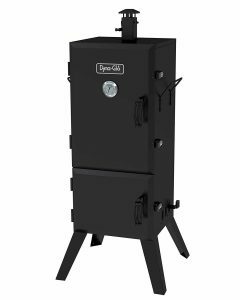 But the hands-on approach of operating a charcoal smoker produces a signature taste and flavor that just can’t be beaten. Not to mention the pride you feel after a job well done. If you are dead set on an electric pellet smoker, you can check out the following: The Best Pellet Grill, Three Can’t Miss Options To Choose From. Understanding how to prepare everything and operate the smoker isn’t hard, and if you follow the below instructions, you can look forward to many flavorful and filling meals in the future. 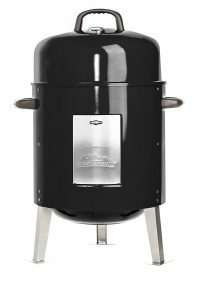 What Is A Charcoal Smoker? A firebox that looks like a metal bowl or box with legs and a grate on the bottom of it to hold your charcoal. A water chamber in the midsection that holds a water bowl that sits between the coals and the cooking chamber. There is usually an access door here as well for adding additional fuel, wood chips or water. A cooking chamber that resides above the water bowl and extends to the top. This includes one or two wire grates for food placement and a lid to contain the smoke and heat. 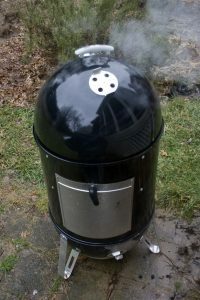 A charcoal smoker should also include two or more air dampers to control the airflow and temperature. Every charcoal smoker should have an air vent on the bottom of the unit and the top for the best temperature control. The big appeal of a charcoal smoker is its ease of use. For the impatient among you, here is the quick and dirty lowdown on how to use a charcoal smoker. You fill the firebox with hot charcoal embers. Place the center section (water chamber) on top of the coals and fill the water bowl with liquid. This can be anything from water, apple juice or beer to name a few. The cooking chamber goes next. The food goes on the wire racks over the water bowl. Add wood chunks or soaked wood chips to the coals. Use the air vents on the top and bottom to adjust the airflow to the desired temperature, which should be 225 to 250 degrees typically. Monitor the internal meat temperature with a meat thermometer. For more in-depth and step-by-step instructions, read the rest of the article below. The quality and type of charcoal you use is almost as important as the smoking technique itself. Your choice could ultimately be the deciding factor in determining the meat’s flavor and taste, as well as the efficiency with which the smoker performs. For the purposes of smoking, it is a good rule of thumb to steer clear of charcoal laced with additives that make it catch fire faster. Not only is this harmful to the environment, but the meat smoked using such charcoal has a distinct, unpleasant taste. Your best bet is to use ordinary charcoal briquettes or lump charcoal as the primary burning material. 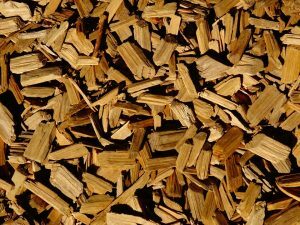 Add a couple handfuls of wood chips from fragrant varieties like mesquite, birch or hickory, to enrich everything with that unmistakable wood smoke smell. Just make sure to soak the chips in water up to 30 minutes before hand before placing them onto the coal bed. If you aren’t a fan of fancy marinades or exotic spices, rubbing any kind of meat you’ll be smoking down with salt and adding a pinch of pepper will be more than enough for a delicious result. If you want to get more creative, you can use a homemade rub, marinade recipe, or scour the internet for ideas. Do the rub down the night before smoking so the spices have time to sink into the meat. Some marinades require you to prepare them as much as a day in advance, so set aside the time to take care of that as well. Start out by placing the smoker somewhere safe outdoors with plenty of ventilation. Before doing anything with the charcoal itself, fill up the water pan until it is about three quarters full. The water in the pan is responsible for producing the hot and humid conditions that are ideal for smoking meat, and it also helps with temperature regulation. Smoking is very different from barbecuing, as the goal with smoking is to cook the meat slowly with indirect heat as opposed to hot and fast over the coals with direct heat. The way you set up and use your charcoal is important, as well as is using the water pan to keep the meat moist. Making adjustments to the vents as the meat is cooking is vital to ensure that the heat stays in the sweet spot for smoking which is between 220℉ and no higher than 250℉. Since smoking is a prolonged process that can take you most of the day if you’re preparing large pieces of meat like roasts that weigh more than five pounds, keeping the charcoal’s temperature consistent is a must. The way in which you set up the coals can make it easier for you to maintain a steady heat. 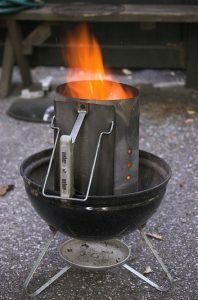 Light your charcoal using a chimney starter (here is a great article on how to use a charcoal chimney starter) first. A charcoal chimney starter is a metal cylinder used for lighting charcoal faster and easier before adding it to your smoker or grill. You can see a list of my top charcoal chimney options here if you don’t already have one. Let the chimney burn for around 15 minutes or until the coals are covered in a white ash. When ready, add the coals to the firebox in the smoker. Another effective means of doing this is to light only a few briquettes of charcoal on fire in the chimney and place them on top of unlit ones inside the charcoal pan. They will gradually light the others on fire without offsetting the temperature. True charcoal smokers will have a water pan included. The pan should sit in the center section of the smoker. Fill the pan ¾ of the way full with your liquid of choice. Make sure the liquid is cool. Cold liquid helps to offset the higher temperatures when starting the grill. The liquid will help regulate the heat down to the ideal smoking temperature. Now you are ready to add the food to the cooking grate. Before placing meat onto the grates, treat them with a fine coating of oil to keep the meat from sticking to them. If there’s only one grate, place larger pieces of meat at its center, and smaller ones toward the edges. There are also taller smoker models that come with two grates. The upper one typically doesn’t receive as much heat as the lower, so use it for smaller bits of meat or vegetables for optimum results. No matter how many grates you have, the items you’re smoking should be evenly spaced, with enough breathing room between them for the smoke to flow up without obstruction. 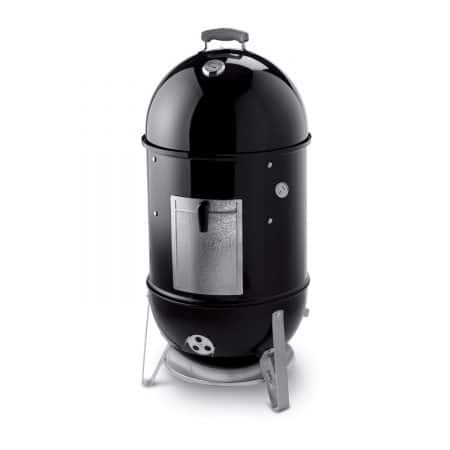 If you are using a charcoal smoker that has a removable lid like the Weber 721001 Smokey Mountain Cooker, position the lid so the vents are above the meat as much as possible. The vents create a steady flow of air running through the cooking chamber. By having the vent directly over the food, you are essentially pulling the smoke through the chamber so it travels right through the meat before it exits the vent. Wood chips and chunks are a great way to give meat added flavor. Chunks work better for longer cooks as they smolder for longer periods. Chips work as well but you will have to add them more often to get the same results as bigger chunks. When the meat is a little less than a fourth of the way done, it is time to add wood chips onto the coals. Use two to four chunks or two to three handfuls of chips and place them directly on the hot coals when you are ready. This part largely depends on personal preference, so if you find that there’s too much wood smoke flavor for your liking or too little, you can adjust the amount of wood and when to start burning them on the next cook. Most smokers have temperature gauges and regulation vents that give you a basic idea of the current temperature inside and allow for smoother regulation. The lower vent pulls air into the chamber while the upper or lid vent lets the air and smoke out. When initially adding your charcoal, start with both upper and lower vents wide open. You regulate the temperate with the bottom vent, depending on how high or low you want the internal heat to be. If the temperature is getting too high, close the lower vent a little at a time until it steadies out at the desired level. Closing it too much will reduce the oxygen causing the fire to die. A good rule of thumb is to keep the upper vent wide open the entire time. You only need to close it if after adjusting the lower vent; it did not bring your temperature down to where you need it. This definitely takes practice and a good idea is to keep notes on how each vent position affected the heat. I have no doubt that after a few attempts; it will become second nature for you. Regardless if your smoker comes equipped with a built in temperature gauge or not, you’ll need to keep track of the smoker and meat’s internal temperature by using a meat thermometer probe. I reviewed some great digital meat thermometers that are perfect for smoking that you can check out here. The built in temperature gauges are usually cheap and can be off by as much as 50 degrees or more so be wary of their readouts. Keep the smoker temperature nice and steady. Adjust it accordingly by adding more coals when needed or letting the existing briquettes burn down. Generally speaking, the longer the meat is smoked, the lower the temperature needs to be. Poultry takes a shorter time to prepare and should be smoked at close to 300°F. Brisket and ribs take longer and the temperature for smoking them shouldn’t exceed 240°F. To get consistent and great-tasting results, it is essential that you don’t disturb the smoker more than necessary. It’s understandable that the temptation to check up on that delicious smoked meat is a hard one to resist, but doing so will result in fewer temperature differences and will keep the coals burning longer. Don’t lift the smoker’s lid unless you’re checking up on the meat’s internal temperature or have to add more charcoal. Lifting the lid is allowing heat and the flavorful smoke to escape. Never check the meat less than an hour or so after your last look in. Smoking is a slow and steady game and the winner is the cook who has the most patience. Smoking food is mostly a hands off process. You can be confident that the meat is, in fact, cooking without checking on it all the time. Be prepared by having a second set of coals ready in your chimney starter in case the temperature inside the smoker starts to cool down on long cooks. Get them hot early in case you need to add them to the firebox. Adding live coals works much better than putting unlit charcoal on top of almost spent coals. Once smoking is complete, you can remove the lid and take the meat out to rest. Experimenting and trying different techniques are part of the learning curve and add to the fun. No two cooks will ever be the same. There are a ton of different variables that make smoking anything but an exact science. But knowing the basics are imperative to starting your journey to smoky greatness. This should cover the basics on how to use a charcoal smoker and give you enough info for your first taste of smoky goodness. Using fresh ingredients, good-quality charcoal and being conscious of the temperature needed to smoke different types of meat will take you a long way. There’s no real substitute for experience and experimentation though, so the more you practice, the more you can expect better-tasting results. 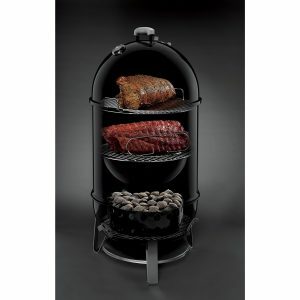 Lastly, I would like to share with you a helpful site if you are in the market for an Electric Smoker. I have spoken to Ted, the owner several times and he is very knowledgeable on the subject and it is a great site to reference if you want to learn more about, or are in the market for an Electric Smoker. You can visit Electric Smoker Guy Here. 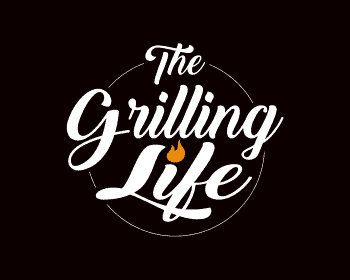 As always, if you or someone you know find this information useful, please consider sharing it with your Grilling friends and on social media! If you would like to leave a comment or have useful tips of your own to share on how to use a charcoal smoker, please do so below. We always welcome your input. I love BBQ and smoked food so i used variety of smokers including electric, charcoal and others, but i love to smoke using charcoal smokers to get real taste. You shared awesome tips and information to use charcoal smoker. I agree. Nothing beats the flavor of charcoal smokers, although pellet grills are improving every year. With that said, I still use my charcoal smokers 8 out of 10 times over the pellet smoker. Thanks for checking in and for the kind words. I see you have some experience. Do you have a personal recommendation for a good starter charcoal smoker you could share with us?